The AU680 is designed for the demanding environments of mid-sized to large laboratories to meet ever increasing pressures on time and productivity. Flexibility of design offers stand- alone operation or connectivity to lab automation systems. 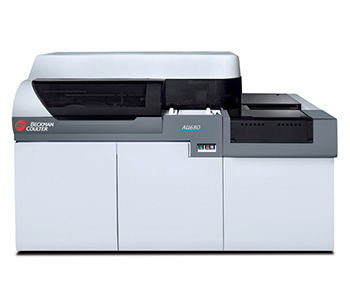 With random access throughput of up to 800 photometric tests per hour (up to 1200 with electrolytes), and a broad menu of over 125 tests, the AU680 delivers field proven reliability and efficiency. Dimensions (W x H x D): 77 x 50 x 39 in. Seeking Au 680 or 640 for my laboratory . email some info and quote. My company purchased AU680 a year a go,but we couldn’t load some of the reagents like ddimer. The local distributed couldn’t support. Is there any chance we can get technical support from u.